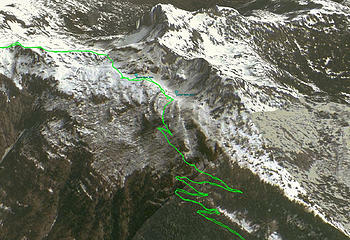 NWHikers.net - View topic - When did Escondido Ridge around the PCT burn? 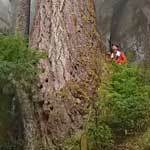 Forum Index > Pacific NW History > When did Escondido Ridge around the PCT burn? I just got back from a climb up Summit Chief and the PCT just below Vista Tarns goes through a snag forest from a relatively recent burn. 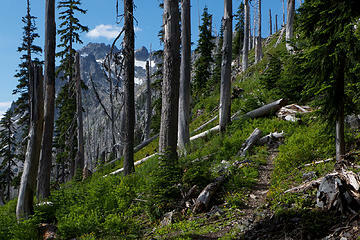 I assumed this was part of the 2009 Lemah Meadows burn that closed the PCT for a year, but it's not. The PCT segment climbing Escondido Ridge was part of the detour route at that time. I found lots of online references to the 2009 Lemah Fire, but none for the burn high on Escondido Ridge. Does anyone remember this or can provide a link to a contemporary account? Looking at Google Earth historical imagery the fire occurred sometime between 1998 and 2003. 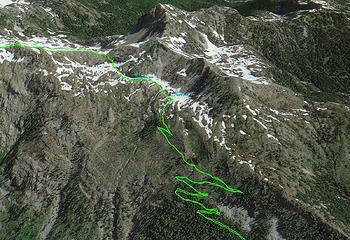 The green line is my GPS track for Summit Chief, so it doesn't follow the PCT over the ridge to Waptus Lake. 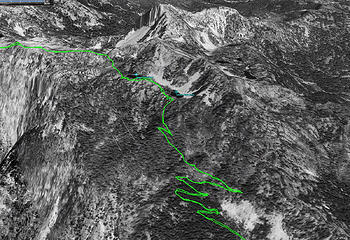 Most recent 2014 imagery of Escondido Ridge showing burnt area. My impression is that it burned in 1994, but I don't know how to account for the google image. I hiked that section of the PCT in 2004, and there were lots of wildflowers and new life among the blackened snags--- not all that different from your recent photos, actually. Regrowth happens very slowly at that altitude/snowpack, so what I saw seemed consistent with a fire 10 years earlier (but I'm not an expert on these things). And I think several guidebooks referred to a fire in 1994. Is it possible that the historical google image has the wrong date? Or maybe the dark areas that look like forest are actually something else, like blackened debris on the ground? Whenever it happened, that recovery area is one of the most beautiful places I've ever seen--- the contrast of wildflowers and new greenery against the blackened snags is really breathtaking. You are correct that that fire (and many others) were in mid-summer, 1994. I visited the ridge line of Summit Chief and the lakes below in late August of 1995 with a friend and her 3 mo. old Golden Retriever. We were surprised by the burn which was so very hot that it completely burnt out the meadow and followed the roots of trees at the top of the ridge. If I recall the idiot who stared the Icicle Fire by burning brush was later prosecuted. The price exacted from his hide could not have been near enough for the devastation the fool caused. FWIW:I hiked that section in 2001 and it was burned then. Is it possible that the historical google image has the wrong date? I'm quite sure the date is correct. Some of the same imagery is available in the DOQ dataset at http://earthexplorer.usgs.gov/ and the date Google Earth shows agrees with the metadata there. I also wonder about the dark area -- it doesn't look quite the same as the parts that didn't burn. 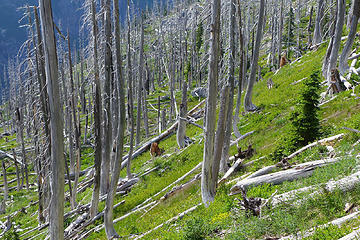 I was up in the Waptus burn area this past weekend and was struck wondering again when this fire occurred. Google book cache results mention a 1929 fire but I can't see any details about it. Anyone have any more info on the Waptus Burn? I was on a fire heading in to Pete Lake in 1979. Nothing real recent heading in to Waptus that I recall. The "Waptus Burn" was in 1929 regardless of what the PI has. I was up in that general area in the fall of 1974 working on BARE rehab projects. Not up on that ridge but there was a huge fire event that year. One thought is that ridge may have burned twice. Fires come in multi event cycles typically. That is a somewhat common forest fire rotation. Not everything burns in the first fire. A good portion of what burns in the first fire is killed and adds to the destruction of the second fire. I say destruction because fires with large woody debris on the ground have the soils 'nuked' and recovery at elevation is beyond our lifetimes. Don't be afraid to look for multiple fire 6 - 10 years apart for what you see today.